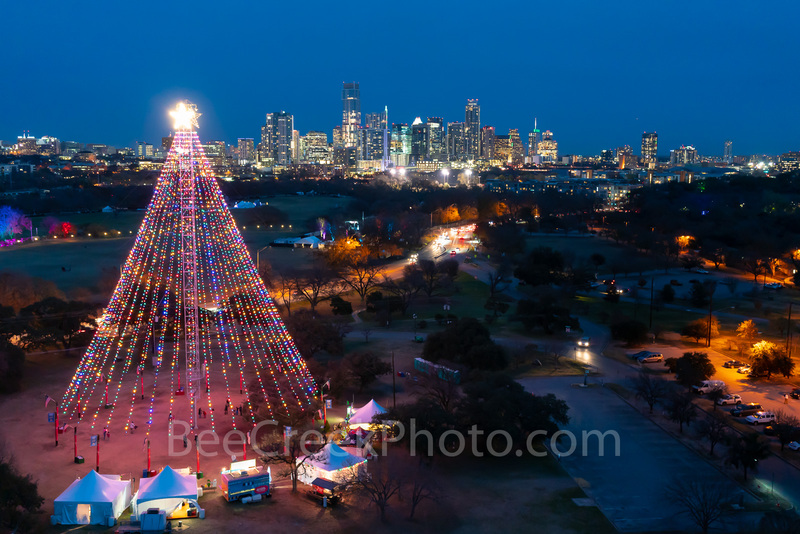 Austin Aerial Skyline - Zilker Christmas Tree with the city skyline in the background. Every year after Thanksgiving the tree is lit with over 3000 lights and since it stand at 155 ft it is the tallest man made tree in the US. Actually it is a moon tower built in the early 1900 to improve lighting in the downtown part of the city. Lucky for us it makes a great christmas tree. This is year number 52 for the lighting of the zilker holiday tree as it is called. Photo © copyright by Bee Creek Photography - Tod Grubbs / Cynthia Hestand.